Born half-Roman, but all business, the Battle of Châlons saw “the last great Roman general”, Flavius Aetius, at his finest! And “finest” would mean both political maneuvering with shifting alliances as well as tactical finesse. The build-up to the Battle of Châlons (also called the “Battle of the Cataulnian Plains”) is incredibly complex, and we are not certain which parts are actually true. Certainly much of the “invasion” of the Late Roman Empire were fierce peoples — Vandals, Goths, Alans, etc — who were fleeing from the even-fiercer Huns. But Hunnish leaders like Attila, were far more than merely brutal, playing alliances, taking advantage of the deaths of neighboring leaders, and playing both Eastern and Western Romans as clients and victims. The Roman leader, Aetius, had Hunnish warriors fighting FOR him in earlier battles, and spent time with both the Huns and Goths as a honored hostage (learning much about both peoples while there.) In fact, his father was a Roman general of “Scythian” origin, one of the original groups of powerful mounted nomads, so you could say he was closer to his allies and adversaries than most Roman commanders of the day, which is one reason he was one of the most influential men in the Western empire for over 20 years. Attila had spent time “visiting” various parts of both East and West, but taken home more loot from the East and decided there must be riper pickings in the West. Adding much of Gaul to his empire and plundering the rest looks to have been his aim, but his movements suggest as much opportunism as strategy. The “two” armies involved at Châlons were a varied hodge-podge of peoples, with the “Hun” side including various Goths, Alans, Burgundians, Rugians, Franks, Thuringians, and many more. The “Allied” side was primarily Visigoth and “Roman” (which would be a broad mix of peoples in the same uniforms) but also included various Celtic and German tribes, Romano-Britons and their own allies of Franks, Alans, and Burgundians. Now, you can apply those multi-faceted armies against each other in a way that really shows off their diversity. 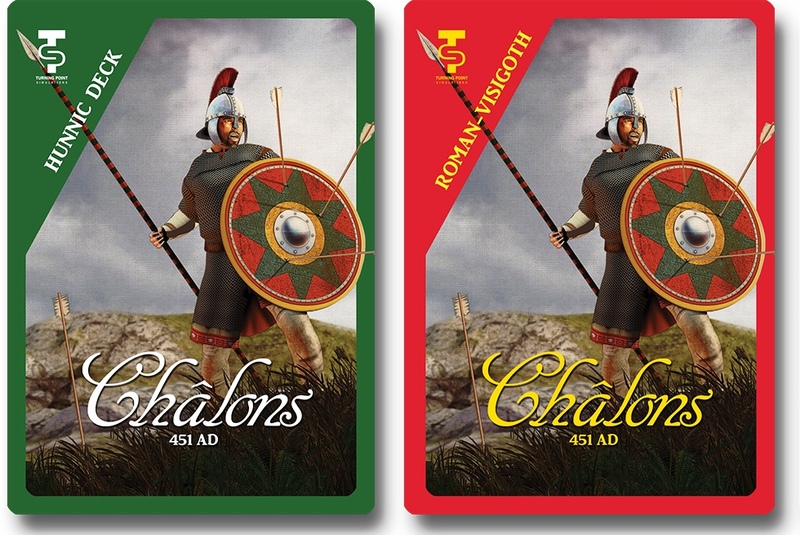 Our Châlons game uses full-sized cards for each unit (rather like our Arbela game by the same designer). 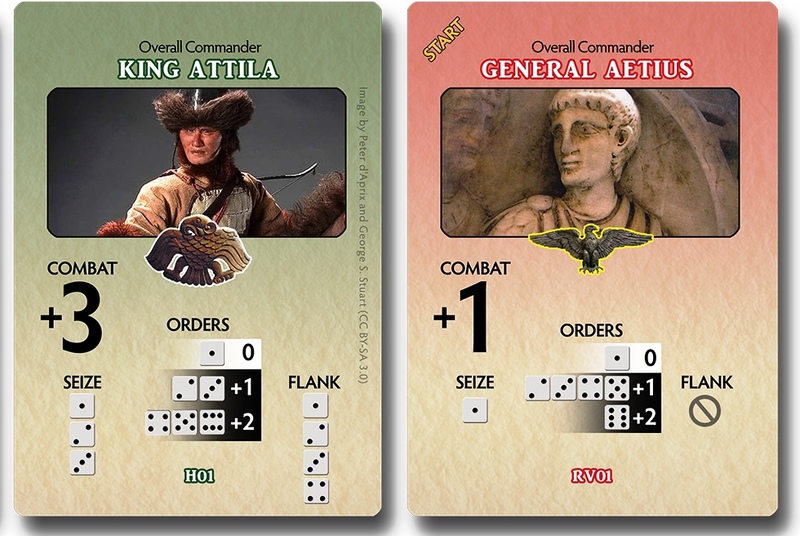 Each card has all the information you need for movement, activation, combat, and morale. Players set up their best available deployments to execute their strategies and win the game (if the gods of fortune smile!). Your leaders allow activations and assist in combat. Some troops may make choices other than what the commanders might have wished (and that can work out well or otherwise). It’s all part of presenting this chaotic game in a timely and playable fashion. A full battle will last 60 to 120 minutes. And then you can swap sides and try it again! 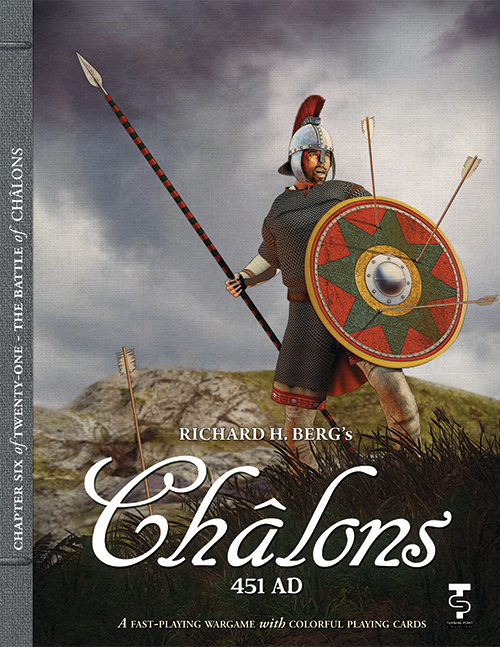 Châlons comes with full-sized, coated playing cards, a sheet of information counters, playing field diagram, dice, and all the rules you need. Bonus Item: Purchase this game directly from us and we'll include a small extra game, Bloody Hunlikely! from our sister division Against the Odds Magazine. 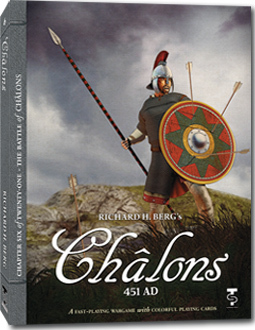 This solitaire game covers Attila's rampages across Europe, including the one that ultimately lead to the Battle of Châlons.